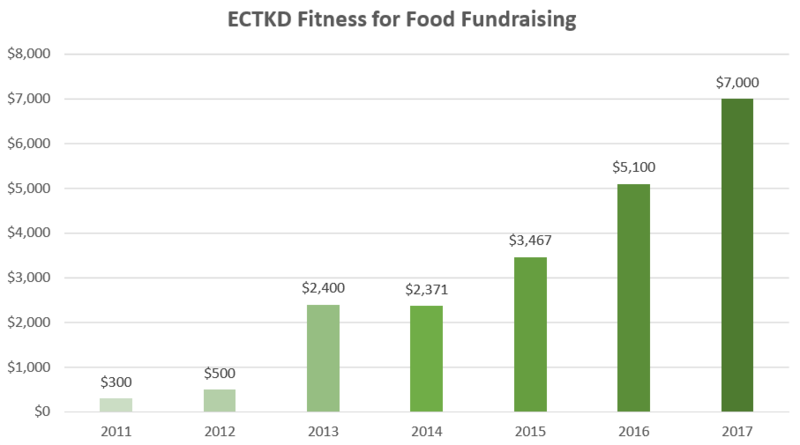 Donate to our 2018 Fitness for Food Fundraiser through our Donate page! FITNESS FOR FOOD FUNDRAISER:Thank you for another great fundraiser this year. The 2016 fundraiser raised a total of $5100 with we were able to help provide a holiday meal for over 100 families in the S.E.Polk community, $150 in gift cards to Target, $100 gift card to Walmart, plus a cash donation of $273.73. Our students and instructor did a total of 21,492 exercises to truly earn those donations.This is a great way the kids get to learn that they need to work and earn things through life, they get to learn and see how they can personally help another family through the holidays and that THEY CAN make a difference in our community. ECTKD would also like to express huge thanks to many local businesses who helped us make our fundraiser such a huge success. We also had the honor of our mayor, members of our fire department and our SEP Resource Officer come and support our students. Please continue to support our local businesses that helped support us. Below is a video of the 2013 Fundraiser that appeared on WHO-TV 13.